The small and unspoiled island province of Camiguin in Northern Mindanao boasts white beaches, diving spots, mountain trekking, volcano tours and a few waterfalls. Camiguin is a paradise for both tourists looking for tranquility or thrill-seekers hungry for adventure. 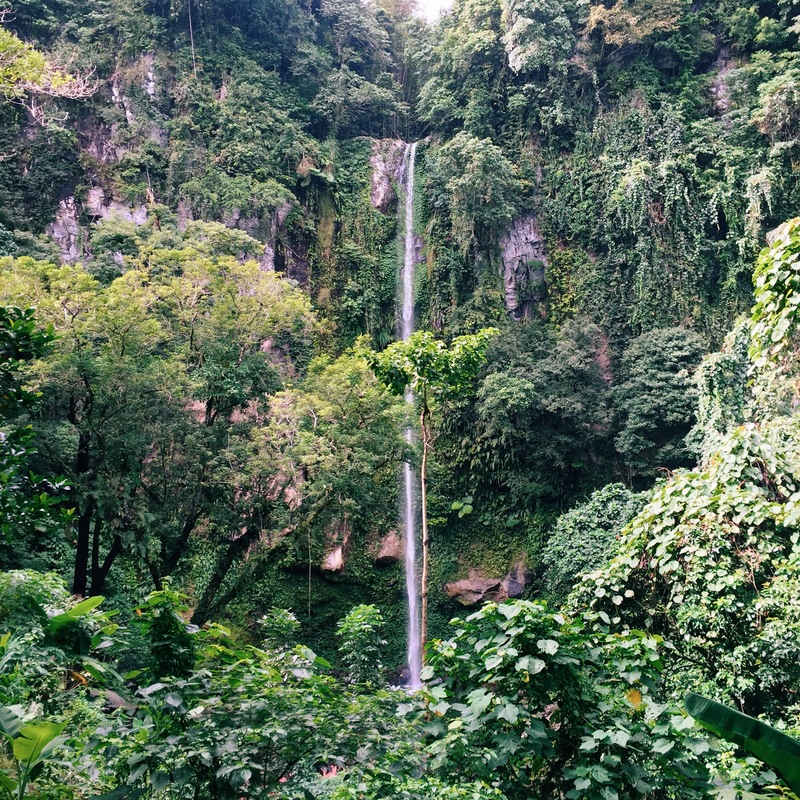 One of the spots the we highly recommend: the 250-meter tall Katibawasan Falls just 5 minutes from the island’s capital, Mambajao. From the airport, take a shuttle to CDO City Proper. We took the LAX Shuttle which has stops at Centrio Ayala Mall and Agora Integrated Bus Terminal. Drop off at Agora Eastbound Integrated Bus Terminal. Travel time is 1 hr. From Agora Bus Terminal, ride a bus bound to Butuan. Drop off at Balingoan Port, an hour or two from CDO. Walk from Balingoan Bus Terminal to Balingoan Port. The port is just 2-3 minute walk from the bus terminal. Ride a ferry going to Benoni Port. Travel time takes a maximum of 2 hours. From Benoni Port, ride a jeep or shuttle van outside the port going to Mambajao. Travel time is around 30-45 minutes. Once in Mambajao, you may ride a rela (a local and bigger tricycle) or habal-habal going to your guesthouse or straight to Katibawasan Falls. For the latter, ride will take 20-30 minutes. We entered Mindanao via CDO as part of our 9-day Mindanao adventure to Davao Oriental, Surigao del Sur, Butuan, CDO, Iligan and Camiguin. CDO is the nearest entry point coming from Manila. However, there are direct once-a-day Cebu-Camiguin flights via Cebu Pacific. We read that there’s a direct ferry from CDO to Camiguin but as of January 2016, Paras Sea Cat from Macabalan Port in CDO to Camiguin has been discontinued. There’s a variety of resorts and inns in Camiguin, most of which are located in the northern tip of the island facing the picturesque White Island. We stayed at Paguia’s Cottages where we got a spacious cottage for 4 for only P800/night (which we had to bargain). Paguia’s Cottage is in front of the more popular Paras Beach Resort. Here’s a list of hotels in Camiguin. There are also restaurants along Camiguin Circumferential Road near Paguia’s Cottages. Our favorite is the cozy Italian restaurant Luna, which serves brick-oven pizza and a whole range of flavorful pasta. Katibawasan Falls is one of our stops for our 9-day Mindanao adventure to explore Davao Oriental, Surigao del Sur, Butuan, CDO, Iligan and Camiguin. We entered Mindanao via CDO and went to the farthest stop in Davao Oriental, then explored all spots en route back to CDO, and finally riding a boat to Camiguin via Balingoan Port. If you’re coming from Manila, you can either fly to CDO, or fly to Cebu then fly to Camiguin. From Mambajao (pronounced as mam-ba-hao), the capital of Camiguin, ride a habal-habal to Katibawasan Falls. You may also opt to hire one from your guesthouse. Don’t forget to haggle for the price! It’s a smooth uphill ride from the island’s main road, passing through Camiguin’s thick forest. The ascend ends at multiple stalls selling clothes, souvenirs and kiping, Camiguin’s delicacy made of thin cassava wafers with coconut syrup. There’s only one entrance to Katibawasan Falls; and the entire area is enclosed and is protected by the local government. Upon entering the white gate, you will immediately have your first glimpse of Katibawasan Falls. Just a few meters from the gate, you’ll see the stairway leading down to tables and the falls’ basin. The basin is partially man-made, with shallow ground perfect for wading. The falls water is crystal clear and very cold, almost not welcoming considering the high altitude of the falls and cold breeze blowing from the forest. The best views are from the top of the stairway where you can behold the towering beauty from its peak to the basin below. Getting lost in Katibawasan Falls, Camiguin. Our trip to Katibawasan Falls only took a couple of hours so we recommend on making this just one of your stops when going around Camiguin Island. There are a lot of restaurants serving delicious food in Camiguin. If you’re on a tight budget, we still recommend trying out Luna or La Dolce Vita, both in Mambajao, at least once in your stay. There are two other popular falls in Camiguin: Tuasan Falls and Binangawan Falls. However, when you ask locals which among the three is the most beautiful, you’ll get a unanimous answer: Katibawasan Falls.